I didn’t know that parking lots needed to be sealed to protect them from exterior forces. It’s interesting how you point out that sealcoating a parking lot or asphalt makes the surface smoother and ideal for painting lines. Sealcoating a parking lot probably also helps it last longer and need less repairs in the end. I liked how the article specified that seal coating acts as a water barrier. I remember when I was young my father’s driveway practically floated away during a flash flood because he was too cheap to seal coat it! We will be sure to ask about this option to protect ours! I agree that when it comes to old asphalt, coating it helps it look new. I can see how this is something useful to know when you own an asphalt driveway or parking lot. It makes sense that if your parking lot looks well taken cared of you would be able to get more clients. Thank you for sharing. I didn’t know that pliable asphalt reduces cracks in high traffic areas. I wonder if parking lot striping franchises offer paints that would help the sun soak into asphalt so it will be more pliable. It would definitely be of benefit to do some kind of preventative work on your parking lot to ensure that it lasts for a long time without needing repairs or replacement. That sounds important that sealcoating protects against water damage to the base material. You wouldn’t want a small surface crack to turn into a fissure all the way down. Water is a natural weathering agent, so it’s important to protect against it. I would imagine that curb appeal, including the parking lot, could be very important when you own or rent a large commercial space. Customers will probably have a great first impression if they pull up to a nice looking building with a well-paved lot. I like how you pointed out that sealcoating protects the bond between the aggregate and liquid asphalt. It also seems good that this process also makes the lot look new again. I do like how you mentioned that sealcoating can be beneficial for asphalt with heavy traffic as it can reduce cracks from being created. That would be perfect for parking lots who just had their property filled as it would protect their investment making their actions more cost-effective. Personally, I do hope more parking lot owners would apply sealcoating to their properties especially after filling them as having crooked parking lots is never good for us drivers. A smooth flowing parking area is a dream come true once obtained. 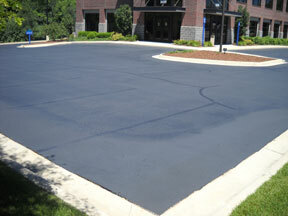 Thanks for the interesting article detailing the benefits of sealcoating for parking lots and driveways! I like that you mentioned that repairing asphalt can increase the curb appeal. My wife and I are planning on doing some renovations before we sell our home, and I think repairing the asphalt on the driveway is a great idea. Thanks for the information–I’ll be sure to reach out to a local contractor today. It really helped when you said that the seal coating will keep the driveway from having big cracks and being damaged. With that in mind, I will relay to the contractors that I will be hiring to do this procedure after paving it. It’s just that our driveway has never been paved before because we lack the budget back then due to paying our loans.